February sees all five naked eye planets in the dawn sky, though that’s about to change in March. But the good news is, now is the time to hunt for a sometimes planet, sometimes asteroid in the early evening. We’re talking about 4 Vesta. The 4th identified resident of the asteroid belt, discovered by Heinrich Olbers in 1807, Vesta made its way into many planetary listings in the 19th century before its demotion to asteroid. It then enjoyed a very brief six month resurgence as a planet in 2006 along with Ceres and Eris (nee Xena) before the International Astronomical Union demoted the lot along with Pluto to the realm of the dwarf planets. Such are the whims of the universe. 4 Vesta is actually the second largest asteroid belt member, and the brightest asteroid as seen from the Earth, shining at magnitude +5.5 near opposition—bright enough to see with the unaided eye—Vesta can be seen from a good dark sky site if you know exactly where to look for it. 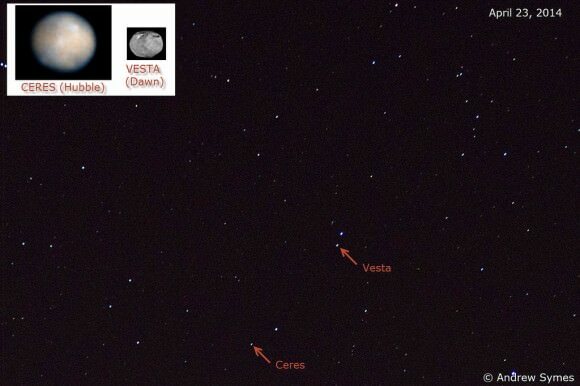 February 2016 sees Vesta about 50 degrees above the western horizon at sunset, right along the Cetus-Pisces border. Vesta is worth tracking down this month, as it moves south of and parallel to another solar system resident: +5.9 magnitude Uranus. Follow both Vesta and Uranus, and you can see the difference in distance between the two betrayed by their motion: Vesta covers 10 degrees through the 29 day leap month, while Uranus spans just over one degree. Vesta and Uranus are 2.9 AU and 20.5 AU away from the Earth this month, respectively. A fitting pairing with the ice giant world in the icy month of February. The waxing crescent Moon also pays the pair a visit, passing between the two on February 12th. The Moon actually finished a series of occultations of the planet Uranus worldwide in 2015. Stick around until April 9th of this year, and you can witness a rare occultation of Vesta by the Moon visible from the central Pacific and Hawaii. Vesta is now shining a magnitude +8, 1/6th (2 magnitudes) fainter than it appears at opposition, but still a decent grab with binoculars. Vesta reaches solar conjunction on May 22nd, 2016, and once again reaches opposition on January 21st, 2017 . Follow Vesta as it threads the needle between the the 10” wide +7th magnitude binary star pair HIP 6630 and 6679 on February 14th, and then passes less than one degree from the +4th magnitude star Nu Piscium on February 26th. Jupiter joins the evening sky soon as Vesta recedes, reaching opposition for 2016 on March 8th. A mere point of light in the telescopes of astronomers for centuries, Vesta is no longer part of terra incognita map of the solar system. NASA’s Dawn spacecraft revealed the misshapen world in stunning detail starting in 2011. The innovative tri-ion engined Dawn spacecraft then went on to perform another first, when it ‘broke orbit’ around Vesta and headed to its current and final home in orbit around Ceres. Vesta is also one of the very few asteroids that we have meteorite samples of right here on the Earth. Vesta also lends its namesake to a population of related V-type asteroids, known as Vestoids. All cosmic thoughts to ponder as you track down this worldlet during these cold February evenings. Whether you consider it a planet, asteroid or Vestoid, be sure to check out Vesta and friends this month.